Eheim pumps have superior quality ; ceramic shaft, ceramic and carbon bearing. 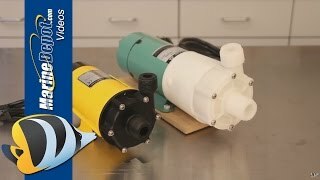 These pumps are suitable for use in or out of fresh or salt water. These pumps are nearly silent and have low energy consumption. Hose Connection (Suction Side): 1/2"
Hose Connection (Pressure Side): 3/8"
Dimensions: 5.7" x 3.0" x 4.1"
Integrated pre-filter. Suction intake nozzle for hose connections. Can be unscrewed and sealed if suction is effected via pre-filter. I have had this pump running non stop since 2007, and it has never failed. 12 years, wow! I have 4 of these pumps. Quality workmanship, materials and a best in class design on these pumps. They are quiet, efficient and reliable. Mounting options and pipe interfaces are all robust. Highly recommended product!